Tad Szulc, a New York Times reporter published this biography in 1995 some 10 years before the death of John Paul II. I was attracted to it because I wanted to know about Polish history in anticipation of an upcoming trip to Poland. I also wanted to learn the truth about Karol Wojtyla and his papacy given some misconceptions I had about his theology and apparent inaction to address priestly sexual abuse scandals in timely fashion. Through Szulc’s book, I have come to know the man much better and to love and admire him immensely. Written in endless detail, the book traces Karol’s life from a penniless rock quarry worker/playwright during WW II to Holy Father head of the 1 billion member Roman Catholic Church over 27 years. Pope John Paul II was if nothing else supremely confident and determined in his papal approach. He had a low tolerance for dissent. Socially progressive he knew that the communist regime in Poland would eventually come to an end due to its many shortcomings like its unwillingness to grant workers the right to free unions. Hence his patient stance of negotiation, non-confrontation and quiet unflinching diplomacy eventually led to the unravelling of the whole communist world. A more brash or impatient approach would likely have lead to violent confrontation and many deaths. Theologically conservative, his stance against abortion, artificial birth control, the roll and ordination of women, liberation theology and basic ecclesial communities in Latin America and inculturation of the church may have harmed the church. We have seen a falling away of the faithful, the normalization of “cafeteria Catholics” and the growing appeal of the Pentacostal faith whose members are not burdened by central doctrine. However these trends were likely in place prior to his papacy. The sexual scandal case of Priest Marcial Maciel, the leader of the Legion if Christ came later. Church authorities were criticized for slow investigations with conjecture that it was because Maciel was close to Pope JPII and was the greatest fundraiser of the church at the time. In wasn’t until 2006 that Maciel was forced to retire despite repeated accusations over many years of sexually abusing minors and having fathered as many as 6 children. 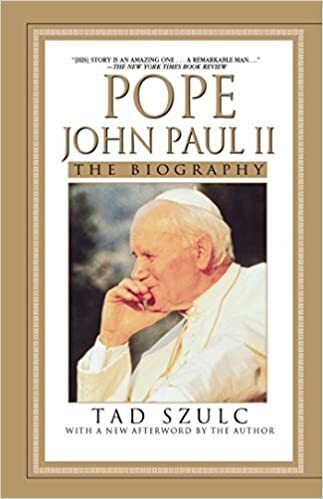 At the end, Szulc gives an assessment of Pope John Paul II as a man who enjoyed immense personal popularity and respect but who was unable to transfer that acceptance to the Church which he headed. While leaving the reader to draw his own conclusions, Szulc suggests that John Paul II may have failed in important aspects of his duties as head of the Church. I am having none of it. Through his immense suffering and love, Pope John Paul II has become my hero – a true witness to the Faith who fostered a positive difference in the lives of millions of people in our time. 4.5 of 5 stars – a great read!